Empire Beauty School students and staff across 21 states are collecting donations for women’s shelters/anti-domestic violence programs across the country this month. The donations, in the form of needed items such as food, clothes, and cleaning and beauty supplies, will go directly to victims of domestic abuse. The donations are being collected at Empire’s 110 schools for local anti-domestic violence programs in their area as part of the Empire Gives Back campaign. 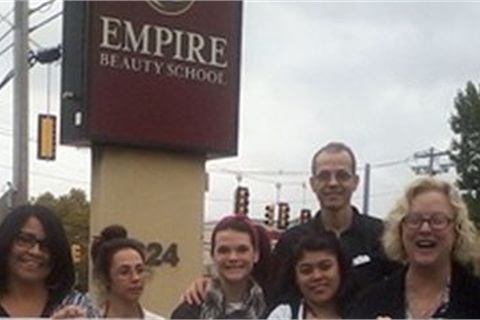 The parent company of Empire Beauty Schools, Empire Education Group, owns and operates beauty schools in 21 states and is headquartered in Pottsville, Pa. Empire holds fundraisers throughout the year to raise cash for programs such as educational endowments for shelter residents who wish to attend beauty school and free beauty services to shelter residents and their children. Empire Gives Back has raised more than $750,000 in cash and donations for women’s shelters across the country. For more information, visit www.empire.edu.